Our primary concern here at The Alaska Sleep Clinic is to help you, and your bed partner, get that much needed rest throughout the night. That's why we feel compelled to tell you about some of the potential health risks associated with frequent snoring. All to often snoring gets written off as a mere nuisance by your partner who has to listen to you "saw logs" all night long. With approximately 20% of the adult population, and 60% of men over the age of 40 snoring regularly, it's easy to believe that snoring is relatively harmless. And yes, in many cases snoring can be nothing more than an annoyance for your partner. However, there could also be some serious potential health risks connected with frequent snoring. But first, lets take a brief look at some of the potential causes of frequent snoring. Age. As you're probably aware, when you begin to age your body naturally begins to relax and lose muscle tone, requiring more effort to keep your body defined. These processes also occur in the throat and tongue muscles causing the muscles there to relax and fall back into your airways causing obstructions that lead to snoring. Weight. Your weight can play a large role in whether or not you snore. If you are overweight you more than likely have an excess of built-up fatty tissues in your throat as well as poor muscle tone leading to a restriction of your throat muscles, thus causing snoring. Alcohol consumption, smoking, and medications. Alcohol, smoking, and some medications increase muscle relaxation allowing the flesh of the throat to relax and disrupt airflow. Smoking also irritates the nasal passages and throat muscles causing inflammation of these areas and further restriction of airflow. Nasal and sinus problems. Seasonal allergies and sinus infections can cause swelling of the nasal passages making breathing difficult and snoring likely. A deviated septum can also cause snoring due to the imbalance in the sizes of breathing passages. A severe deviated septum may even lead to sleep apnea. Sleep posture. Sleeping on your back puts you at a higher likelihood of snoring. The tissues at the back of the throat can more readily fall back and cause partial or complete blockage of the airways leading to snoring. To avoid snoring, try changing your sleeping posture by sleeping on your side. Some of the causes of snoring and their effects are relatively benign and can easily be remedied by simple things such as changing your sleeping posture or moderating your alcohol consumption. However, snoring can also be a red flag of a much more serious health issue, one that left untreated, could be fatal: obstructive sleep apnea. Strain on Heart. Untreated obstructed sleep apnea often results in high blood pressure, which can lead to an increase in heart size creating a higher risk for heart attacks and strokes. Arrhythmias. People with sleep apnea run the risk of a higher chance of having cardiac arrhythmias, most commonly of which is atrial fibrilation. These are fluctuations in the hearts natural rhythm in which the heart may beat too fast, too slow, or irregularly. While arrhythmias are common and often nonthreatening, when they are coupled with sleep apnea they can be cause for serious cardiac concern. GERD (Gastroesophageal Reflux Disease) is a chronic digestive disease in which stomach acids back up into the esophagus and irritate its tender lining. Because of the disordered way a snorer or sleep apnea sufferer's throat closes as air moves in and out of the lungs, changes in pressure can cause stomach acids to backup into the esophagus during sleep. Low oxygen levels in the blood. If you're not breathing regularly your body isn't getting the levels of oxygen in the blood stream that it needs. This can cause constricted blood vessels in the lungs, which may lead to pulmonary hypertension if left untreated. Long interruptions of breathing. One of the most common effects of obstructive sleep apnea is frequent interruptions of breathing. If an interruption in breathing lasts more than 10 seconds and is frequent throughout the night, which can lead to frequent waking from sleep. Frequent waking from sleep. If you suffer from obstructive sleep apnea and have frequent interruptions in breathing, you may not even realize that you frequently wake from sleep as your body is startled by the lack of oxygen causing you to wake and thus disrupting your sleeping cycles. Light sleeping. 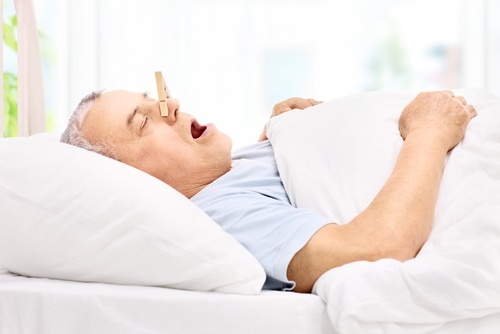 Many sufferers of untreated obstructive sleep apnea end up sleeping lightly as a way of attempting to try and keep their throat muscles tense enough to maintain airflow. Excessive Daytime sleepiness can affect both those that snore and those that sleep next to snorers. Not getting enough sleep throughout the night on a regular basis causes many to feel tired and drowsy during the day. The side effects of daytime sleepiness can range from poor work performance to personal injury. Lack of sleep results in a decrease of awareness and reaction time making drowsy driving extremely dangerous. Chronic headaches. Snorers often report frequent morning headaches, which are due to the alterations in the levels of oxygen and carbon dioxide in the bloodstream.